Level is 10 again / 5. You guys seeing those cold temps going on. Minn. -70 below 0. Chi. 50-60 below. etc. Global warming lmao. Biggest scam since the central banks. Anyone that knows a bit about plants know an increase in co2 increases plant growth and self adjust. The air holds about a 600ppm (parts per million) an increase in co2 to 1000 ppm grows plants aprox. 24% larger in the same period. Holland is the master of this technique and world leader in their massive greenhouses. There is no way we humans if we really tried to pollute way more we would not even put a dent in the climate change. It is the Sun at 95%/ co2 represents .002% of the air (so give me a break with the global warming lies). The rest is a scam for them to collect taxes and live off us even more. All the data I have so far has us about 11-13% below normal world crop yields and this is prior to January. Get ready for massive increases in food prices. It has begun. You guys seeing those cold temps going on. Minn. -70 below 0. Chi. 50-60 below. etc. Global warming lmao. 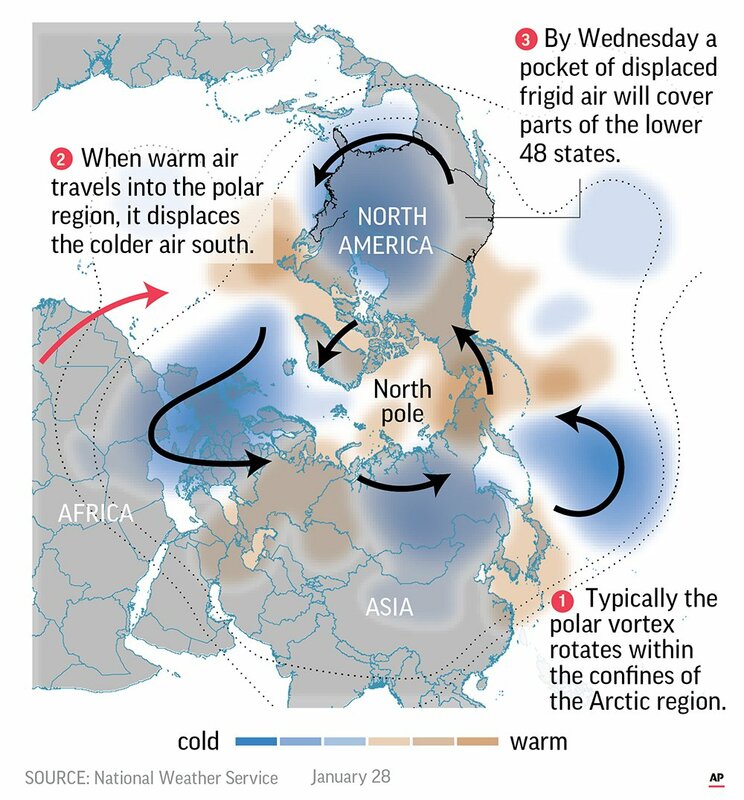 Polar vortex outbreaks are caused by the Warming in the arctic. Ever heard about "Arctic Amplification"? Arctic temperature rose like 3x as fast as other parts, melting the ice caps, weakening the jet stream, and this Polar Vortex Outbreaks. "Get used to polar vortex outbreaks"
Do not wish for warming, you may get more extreme cold and extreme hot temperatures very often. And why is it the "Biggest scam"? Edited by ryanoo, 29 January 2019 - 09:23 AM. Yes I know it is a polar vortex. The grand solar minimum changes the jet streams. The scam is the co2 tax they are collecting and trying to increase and blame us for the problem. 1) the gap is open above so I do not trust much down until it is closed so no super long runners for me until it is resolved. 2) If it was not clear enough the first time News can change the direction of the markets. I wanted to repeat this so there is no misunderstandings. You are absolutely wrong. Global warming is not a scam. Global warming from CO2 emissions is a scam. We are slowly being cooked to death from chemtrails. I am a victim of chemtrails, I know whereof I speak. I have been researching it for years. It is not a conspiracy theory. The drought in California was created by the chemtrails. Deliberate destruction of crops, and yes, raising food prices. I live in Florida, and every year it gets warmer and warmer. This year we barely even had a winter. It used to be about 18 degrees for months at night. The crops need a good, hard, freeze to produce well. The chemtrails can cause nucleated snow in one portion of the country and generate warmth in another. It's also been raining here way more than usual, and every time it rains, you can see the white lines crisscrossing the skys the day before. They can do whatever they want. They are unspeakably selfish, and evil, with no thought of future generations. The Hopi Indians said the end will be close when there are lines in the sky like cobwebs. One day I will come out of the closet and talk about how I found out that the mysterious, debilitating illness I have had since 2005 was caused by chemtrails, and what it is. You spoke once of having 9 months of food saved up. Forget about that. Try 5 years. And know this, if you have food saved up, people tougher and way more hungry than you will find it. Edited by dowdeva, 29 January 2019 - 11:36 AM. There was another presentation, a Powerpoint one by NASA, entitled 'The Future is Ours'. It's horrifying. You can't even find it any more on the web. Google is dummying down their search engine so much that you can't get real information anymore. Pretty soon we will be an ill, overweight, stupid, easily controlled society. Edited by dowdeva, 29 January 2019 - 11:41 AM. dd no arguement about what the chemtrails are doing. It is targeted mainly over CA, US agro areas and certain European countries it is not everywhere. To speed up the food calamity about to take off. Global warming on a global scale is not happening it is cooling by all the data out there not coroupted by the Global warming agenda false data. I should say the data by all those sell out scientist on the NWO payroll that extrapolated the results from data lacking the Sun's influence on earth (which accounts for 95% of climate on earth). Their research is laughable at best. Just like their Darwin theory. A complete joke in scientific terms not just spiritual. Some areas will heat up and others will get ridiculously cold (change of jet streams in grand solar minimums), but the overall is down. Places like the Sahara are blooming and could be the reason the Chinese built roads into the Sahara. They may know a little about the truth and what is really going on. Russia ordered 13 new nuclear ice breakers. Now if there is going to be no ice like AL lying Gore said by 2016 lol or little of it why would they spend the money? Stop drinking their horse manure cool aide folks. Edited by zoropb, 29 January 2019 - 12:11 PM.